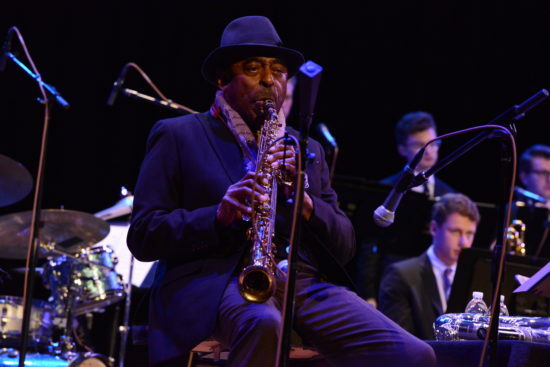 Introducing saxophone great Archie Shepp for a rare performance at Princeton University in early December, Rudresh Mahanthappa recalled his own college days, often spent huddling with friends to listen to John Coltrane’s Ascension into the wee hours. Lessons gleaned from the music of that era, he continued, instilled the idea that social activism was as key a part of the music as aesthetic concerns. 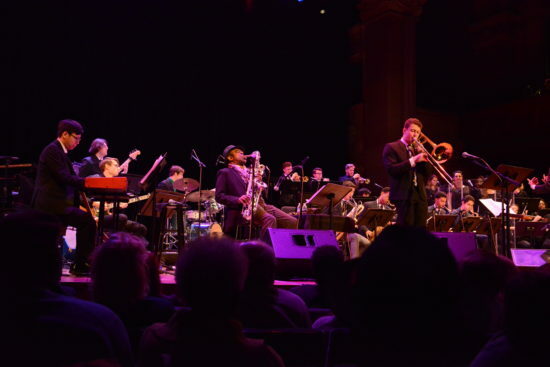 The students in Princeton’s jazz program, which Mahanthappa has directed since 2016, received that lesson first-hand as Shepp spent the week giving workshops before taking the stage with the school’s Creative Large Ensemble under the direction of Darcy James Argue. 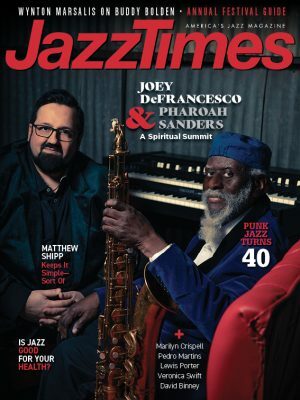 The 90-minute set, in the intimate, wood-paneled Richardson Auditorium, largely followed the program of Shepp’s Grammy-nominated 2013 album I Hear the Sound, itself a big-band revival of the saxophonist’s 1972 classic Attica Blues. 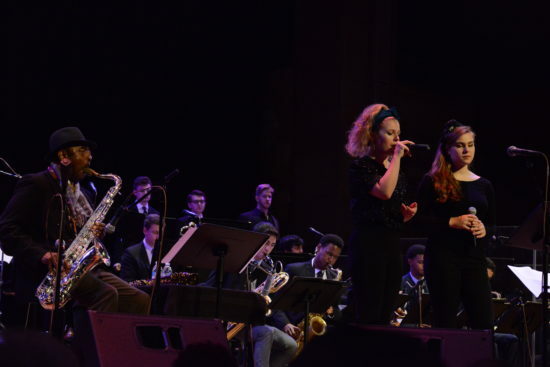 Students Allison Spann and Anson Jones harmonized on the song’s wavering vocal lines while Argue coaxed sharp stabs from the big band, with Shepp interjecting short blurts and blasts before launching into a full-throated solo that displayed his undiminished force. As with most bands at their experience level, the soloists showed varying levels of confidence and inspiration; still, the young musicians summoned an impressive ensemble sound throughout the performance – though Argue occasionally had to right a teetering tempo. That wasn’t a problem during the funky groove of “Blues for Brother George Jackson,” which bolstered the big band with a string quartet and eight-piece gospel choir. 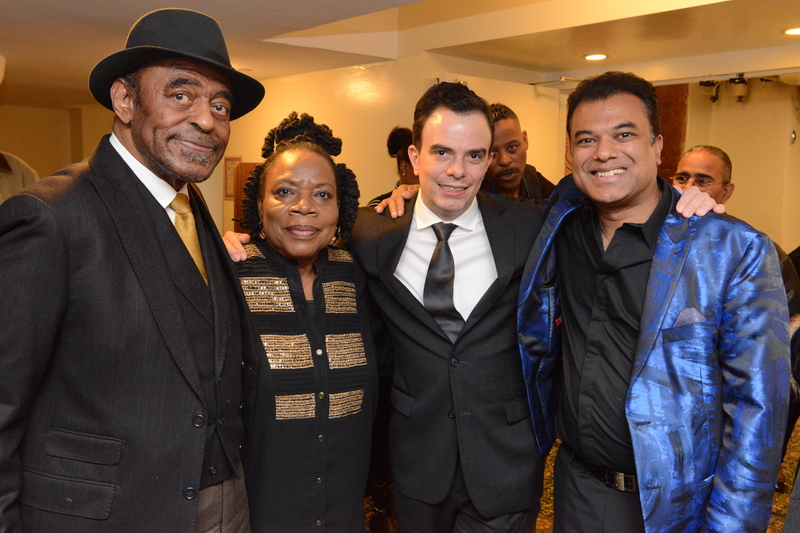 Mahanthappa joked about Shepp’s requests for these extra components, pointing out that “it’s only my second year running the program,” but noted that Shepp’s third ask was met with an immediate “yes” – namely, inviting Amina Claudine Myers to join the band for the occasion. For most of the night Myers served as a ringer in the gospel choir, but took the first of a few turns in the spotlight on her own “Arms,” a wrenchingly romantic ballad in which her own harrowing chants were met with breathy moans from Shepp’s tenor. The duo shared an impassioned but utterly unsentimental balladry that alone should provide the student musicians fodder for study for the remainder of their tenures – and beyond. Myers returned for a lush rendition of Duke Ellington’s “Come Sunday,” in Ernie Wilkins’ arrangement, and for “Ballad for a Child,” which found Shepp’s tender, squeaking soprano scything through the sweet-toned strings and Myers’ steely lullaby. The latter also featured verses by Shepp’s frequent collaborator, French chanteuse Marion Rampal, and the saxophonist himself, whose croaky baritone made a few appearances. Most effective was his stirring vocal turn on the buoyantly poignant “Steam,” inspired by a cousin killed at the age of 15 in a Philadelphia street fight. Rampal’s supple voice turned wistful on “Déjà Vu,” where Shepp showed off his ability to balance raw emotion with a powerful lyricism during a particularly incisive solo. Trumpeter Spencer Hadley showed off a clarion tone on the melody of Massey’s spiritual “The Cry of My People” before taking a solid solo. Tenor saxophonist Diego Aldarondo was a standout on this tune and later on Shepp’s “Ujamaa,” in both cases unfurling fiery lines that managed to keep hold of a narrative thread throughout the length of his solos. He and Spann, who displayed a command of time and an engaging presence on “Quiet Dawn” as well as “Steam,” were the most promising of the young players. The muscular groove of Shepp’s “Mama Too Tight,” written, he explained, about “a lady from Philadelphia well known for brutalizing men,” felt less like a diversion from the political in the midst of an onslaught of sexual harassment headlines, though the ensemble’s performance of it – and Shepp’s bellowing blues – was a celebratory highlight nonetheless. The focus returned to the explicitly political on “Attica Blues” itself, which closed the evening. “State power is unrelenting,” Shepp asserted to introduce the tune, “and is something we should stand up against.” The song – itself inspired by an uprising that Shepp says “they called a riot and we called a rebellion” – offered a funk-fueled rallying cry that felt insistent without being hopeless.